AP Police Constables Merit list, Selection list Results declared @ http://results.apprb.in/ APSLPRB Police Constables PWT Results 2019 Memorandum of Marks. 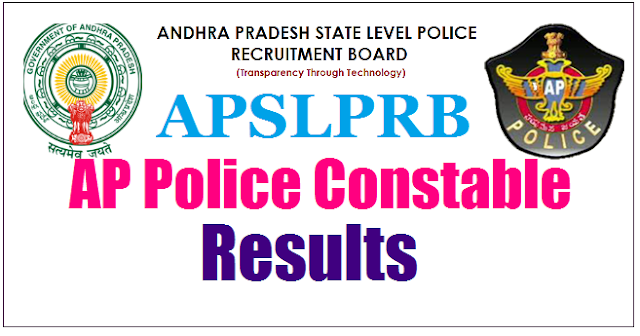 AP Police Constable Posts results 2019 declared: The Andhra Pradesh State Level Police Recruitment Board, APSLPRB has released the results of the recruitment exam held for the police constable post. APSLPRB conducted the written examination for SCT PC (Civil) (Men& Women), SCT PC (AR) (Men & Women), SCT PC (APSP) (Men) in Police Department & Warders (Men & Women) in Prisons and Correctional Dept., and Firemen in A.P. Fire & Emergency Services Department, vide Notification Rc. No.215/ R&T/ Rect.2/ 2018, Dtd: 12.11.2018 Exam Date: 06.01.2019 & 08.01.2019 on January 6 and January 8, 2019. A total of 3,92,785 candidates had registered for the exam, while 3,46,284 candidates appeared in the exam. All the candidates who appeared for the the examination can check their results at APSLPRB official website- slprb.ap.gov.in . To check the results candidates need to login using their login credentials which includes details of their hall ticket/ registration number and their date of birth. Andhra Pradesh State Level Police Recruitment Board has declared the written exam result for Police Constable post. candidates who have appeared in the written examination can check their respective results from the official site of AP Police at slprb.ap.gov.in. The examination was conducted on January 06 & 08, 2019. Along with the result, the Board has also released the answer key for AP Police Constable recruitment exam 2018. The preliminary written examination was conducted on January 06, 2019 at 28 locations, 704 centers from 10 am to 1 pm. Hall tickets were issued to 3,92,785 candidates, out of which 3,46,284 candidates have appeared in the examination. Candidates are also informed that the final answer keys of the written exam has also been released by Andhra Pradesh State Level Police Recruitment Board. Direct link to check AP Police Constable Exam Results. Candidates can follow the steps below to check their results for AP Police Constable Exam.